This public design report provides select non-proprietary design information from the Phase I – Project Definition work products associated with the carbon capture and storage (CCS) system planned for installation at Appalachian Power Company’s Mountaineer Plant, located in New Haven, West Virginia, under US Department of Energy (DOE) Cooperative Agreement No. DE-FE002673. the identification of exceptionally long lead time items. The FEED package incorporated knowledge gained and lessons learnt (construction and operations related) from the Mountaineer Product Validation Facility and the design package also established the fit, form, and function of the project including design criteria, mass and energy balances, plot plans, general arrangement drawings, electrical one-lines, flow diagrams and P&IDs. submitted a decision point application regarding future project plans. 본 공개 설계 보고서는 미 에너지성 협력 협약 No. DE-FE002673 하에 뉴 헤븐, 웨스트 버지니아 (New Heaven, West Virginia)에 위치한 애팔래치아 전력 회사(Appalachian Power Company)의 마운티니어 플랜트(Mountaineer Plant)에서 설치 예정인 탄소 포집 시스템 관련 1단계–프로젝트 정의 단계에서 사용된 공개 설계 정보 중 일부를 선택적으로 제공한다. 이 프로젝트의 궁극적인 목표는 연도가스 탈황 시스템에서 배출되는 235MWe의 연도가스 후류를 처리할 수 있는 상업 규모의 CCS 시스템을 설계, 완공 및 운영하는 것이다. 이 프로젝트는 4단계에 걸쳐 실행되도록 계획되었다: 1단계–프로젝트 정의(2010년 2월~2011년 9월), 2단계–설계 및 허가(2011년 10월~2012년 12월), 3단계–건설 및 시운전(2013년 1월~2015년 8월), 4단계–운영(2015년 9월~2019년 6월). The front end engineering and design (FEED) package developed within Phase I incorporated knowledge gained and lessons learnt (construction, operations, and process related) from the 20 MWe pilot Product Validation Facility (PVF) project for both the CO2 capture and storage systems. The design package also established the fit, form, and function of the project including design criteria, mass and energy balances, plot plans, general arrangement drawings, electrical one-lines, process flow diagrams and P&IDs. The work completed in Phase I continues the advancement of Alstom’s CAP technology toward commercial demonstration at the intended scale. The completed FEED package also provides a sound basis for completion of the project when conditions warrant the continuation of this or a similar project elsewhere. 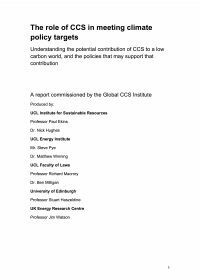 The lessons learnt, insights, and exemplary practices shared within this report should benefit other CCS projects. The purpose of this report is to examine the issues surrounding installation of carbon capture technology on AEP’s generating fleet based on lessons learnt from American Electric Power’s (AEP) project at Mountaineer coal-fired generating station. This report discusses the following issues associated with justification and use of this technology. AEP is an investor owned utility with an obligation to provide electric service. The company is subject to governmental regulation which has implications on AEP’s ability to finance a commercial-scale CCS project. Financial modelling completed by AEP and discussion of results. The report also uses output of modelling and looks at financial risks and the need for financial incentives to fund first-of-a-kind commercial-scale projects. The difficulties associated with financing a project without government backing. Also the cost and use of the CO2 by-product and its competitiveness with other CO2 production sources. AEP’s rationale surrounding its decision to suspend the Mountaineer CCS project. The study focused on commercially available, integrally-geared, inter-cooled, gas compression systems. The scope included all of the equipment required to compress and condition the captured CO2 for sequestration. Geologic characterisation information and actual operating data from the Mountaineer Chilled Ammonia Product Validation Facility (PVF), which operated from 2009 to 2011, provided injection parameters on which to base the design for the commercial-scale compression system. Equipment arrangements, auxiliary power demands, balance of plant integration, and capital and operating costs were considered in the evaluation of each compression system. In the end, two arrangements were considered technically and economically feasible for implementation on the commercial-scale system. Further technical investigation in Phase II of the project would determine which arrangement would ultimately be selected. Both utilise compression of the CO2 to an intermediate condition, followed by variable-speed pumping to the final desired injection conditions. The compressor-pump arrangement allows for greater flexibility and higher operating efficiency throughout the life of the well, which is important based on the expected variability in injection pressure over the life of the injection wells – a key takeaway from the PVF operation effort, and design basis driver for the commercial-scale project. Understanding sub-surface geology is a time consuming and labor intensive process especially in an unexplored region. The Mountaineer plant region in West Virginia is not a part of the conventional oil and gas exploration region and hence there is considerable lack of pre-existing data. Based on the experiences of drilling six deep wells, the associated geologic and geophysical work and the experience from running the CO2 injection operations, AEP has a better understanding of the sub-surface and a CO2 sequestration project. This report explains the level of integration and various interface points between American Electric Power’s Mountaineer generating station and the proposed nominal 235 MWe commercial-scale application of Alstom’s Chilled Ammonia Process (CAP) for CO2 capture. The report provides an overview of the existing systems throughout the plant required to support the operation of the Carbon Capture and Sequestration (CCS) system, and presents how AEP considered and evaluated the integration of these systems during the Front End Engineering and Design (FEED) effort.